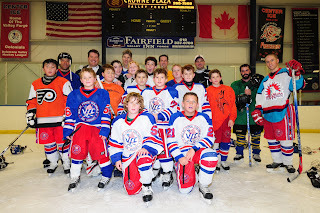 Saturday morning the Dads played against the Kids hockey team. The moms got to cheer from the stands, which I preferred considering I can only skate forward! 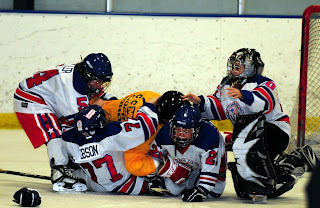 At one point the boys cleared the bench to jump on coach Murphy. 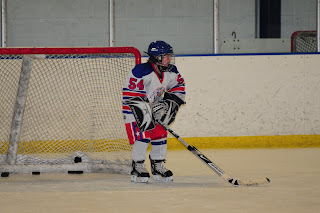 Brandon even briefly filled in for the goalie when he decided to go after another dad! When coach Furst made a few "unfair" moves around the boys his wife shouted "Does it make you feel good to beat an 11 year old." Very enteraining morning! Looks fun! My one son has a father/son game on Dec. 26. I can't wait to watch.